Hambone, Cupcake and Wolfgang prepare fur the howl-idaze! As everyone starts getting into the holiday XMAS spirit, hoomans generally like to decorate their homes with festive lights and wreaths and whatnot. Well, here at the Three Corgis home, the most we can muster up is the ultimate pet costume. The Santa hat and beard! Talk about XMAS spirit, right! If you notice, last year, we only had one hat and beard, so this year, we’ve completed the set! Whoo hoooo! It looks way easier that it is. 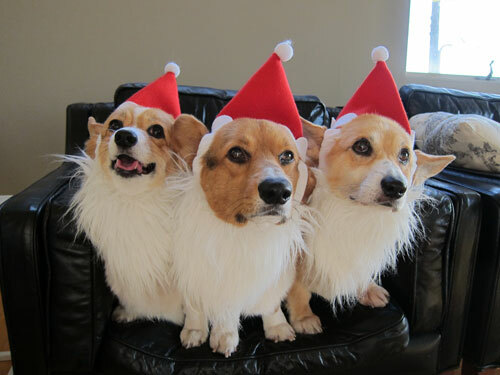 To get these guys to sit still…OMG! Not easy at all. Those were from last year. Look at how cute they are! It makes us laugh how Wolfgang always looks so serious, yet he is the ding dong. And, Cupcake is just a cutie! We hope your howl-day is awesome. Stay safe, hug yer furbabies and have an amazing time off!!! We are fer sure! Previous post: Holiday gifts for 2014 XMAS are here! Next post: Cute pics cuz that’s all we got right now!